Despite never having read Narnia, it didn’t take me long to discover that Piers Torday has written his own Narnia novel. 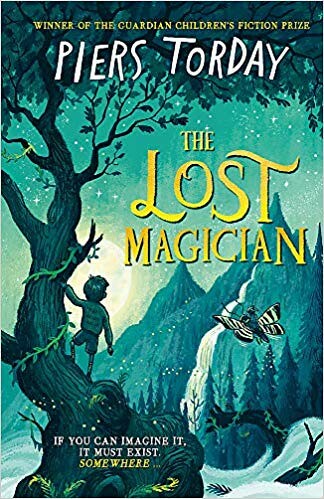 I did know that The Lost Magician was meant to be a homage to C S Lewis’s much loved books. But I’d managed to forget it again. I’m not the best placed person to comment on how well Piers has done, and I know he’s not alone in writing a new story inspired by these books. It’s very well done. I found I wanted to continue reading, despite me not really wanting to, if you know what I mean. There is something about Narnia that stops me, and in a way the same thing happened here, in The Lost Magician. But still I read. The four Hastings siblings have come through WWII. They are scarred, at least mentally, and now they are spending the summer of 1945 in an old house in Wiltshire. Before long the youngest, Larry, finds a secret door to a hidden library, and I’m sure you can imagine how it goes. All four eventually end up on the inside of this library, following different paths, but all of them meeting various characters from our best known children’s books. But all is not well, and the children find themselves at the centre of war yet again. As I said, not being 100% into Narnia, I don’t know how closely this new story follows the original one. Could I have known exactly what to expect from each child? And there will be another book coming to a Library near you. This entry was posted in Authors, Books, History, Reading, Review and tagged Piers Torday. Bookmark the permalink.